The name Africa conjures up images of big game, beautiful sunsets, remote villages and exotic tribes. Blue Africa gives you all of the above and much more! Begin your sojourn in Cape Town and see where the Indian Ocean, the Atlantic and the Cape Peninsula meet. Take an overnight ride on the luxurious Blue Train from Cape Town to colonial Pretoria before embarking on your outdoor adventure at the Sabi Sands Private Game Reserve. 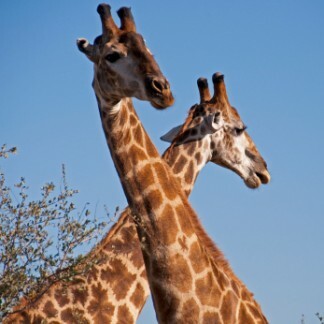 Explore Kruger on early safaris and dine to breathtaking sunsets. Visit Victoria Falls and stay at the Chobe Game Lodge. Blue Africa is an adventure filled with history, culture and wildlife that will make you want to revisit and see more! Arrive in Cape Town where you will be met and driven to your hotel. Begin your Africa adventure with a visit Table Mountain, the most famous natural landmark in Africa. From Table Mountain one of the most impressive views of the world can be seen – the Indian Ocean and the deep blue waters of the Atlantic and the Cape Peninsula which sinks away and allows these two great oceans to meet at Cape Point. Visit the famous Kirstenbosch Botanical Gardens which had its conception when the mining magnate and philanthropist Cecil Rhodes donated the land to the people of South Africa. The garden is home to 4000 of the 18000 species of Flora which are found in South Africa. It is the memorial to one of Africa’s greatest son’s (Cecil John Rhodes) from where sweeping views of the entire Cape Flats can be enjoyed. Take a short ferry ride from the Victoria and Alfred Waterfront to Robben Island. This infamous Island has played an important role in South Africa’s long and turbulent history. Views off the Cape Peninsula and the South African mother city make the ferry ride quite an enjoyable experience. Home to President Nelson Mandela for a large part of his 27 year incarceration, the prison has since been turned into a museum and the tour is conducted by an ex political prisoner who has had first- hand experience of the conditions on the Island. Visits are made to the prison building as well as to the lime stone quarry where the prisoners were forced to work. Return from Robben Island to the V& A Waterfront for lunch. The rest of the afternoon is free for you to explore as you wish. Early morning transfer to the train station where you will register and check in at the Blue Train Lounge. Enjoy pre departure drinks and snacks before boarding the luxurious Blue Train. You will be escorted to your suite and then have an orientation by your butler. Depart Cape Town station at 8:50AM. Brunch is served in two sittings. The Blue Train arrives at Matjiesfontein for a 45 minute off train excursion. You can enjoy a glass of sherry or explore the Victorian buildings. Depart northbound to Pretoria. At 3:30PM high tea is served. Later pre dinner drinks are served at any of the lounges. Dinner is elegant with men in coats and ties and women in elegant evening wear (two sittings). Retire to your suite. Day 6 – Pretoria/Johannesburg/Kruger (Sabi Sands Private Game Reserve)Transfer to the airport and depart Johannesburg on a flight to your luxury safari lodge, Sabi Sands Private Game Reserve. You will be met by your ranger and driven to your exclusive accommodation. Relax and enjoy the wonderful facilities and services. Early morning you take a safari to view a fantastic array of animals as well as the big game. Lunch is a delicious cuisine fusion of South African and European flavors. For an extra touch you can arrange a dinner for two on your private deck with champagne. One last drive in the park is followed by breakfast before being transferred to the airport for your flight to Victoria Falls via Johannesburg. You will be met and transferred to your hotel. This morning visit the famous Victoria Falls. The falls occur where the mighty Zambezi River and plummets from its highest point in a thundering roar of spray and mist. The local name for the Falls is “Mosi oa Tunya”, the smoke that thunders. After lunch, drive one hour to the Chobe National Park in Botswana. Enjoy dinner and a traditional dance performance at the lodge. Early morning embark on a game safari. After lunch enjoy a walking safari in the nearby Kasane forest. Take an evening cruise down the Chobe riverand watch an unforgettable African sunset. Transfer back to Victoria Falls for your two hour flight back to Johannesburg. You will be met and driven for one last night at your hotel in Pretoria. The rest of your day is free for you to relax,shop or explore as you wish.